I am sure it's still delicious and the teachers will love it. That look says it all.........I love to make homemade anything. My neighbor who is in her 60's always uses boxed mixes and she thinks I am nuts for always making homemade. No comparison ~ in my book! Her expression is just hillarious! Bella I think you'd better teach your mum the food course Clara did a few years ago! Bella is a girl after my own heart. When I told my 15yo daughter about this and showed her Bella's frown she said "but Mum cooking from a box is silly. It's cheaper and just as easy to make it yourself". My children think cake-mix cakes have a strange flavour. I think they're too sweet. We're all with Bella on this one. The look on Bella's face is priceless. Hee! I agree with Bella. What a darling picture! Your girls are all beautiful. I concur with the look on Bella's face. The only redemptive ingredient is that package of candy bars. There are those times when the only way to get a dessert somewhere is to use that list. Thanks for sharing. I agree with Bella. Once you get accustomed to from-scratch baking, packaged desserts have a fake and chemically taste to them. I think they changed the Cool Whip recipe as well. I bought some last year because I had an unusual craving for boxed chocolate pudding and Cool Whip (ala my childhood). The Cool Whip tasted like all chemicals. I was soooo disappointed. LOL! that LOOK: indignant, confused, hahahahah. Actually, getting a cake from a box to turn out right is a skill, too. Not everyone can do it! One time while visiting my parents, my mom asked my first-born (who was ~5 at the time) if she wanted to help her make a cake and proceeded to get out a box mix. My daughter was completely baffled at what her grandmother was doing since she had never seen one before. I hope you all have a wonderful time. I hope you were treated as you're a teacher as well! Even with her sour expression, Bella is very lovely! haha - Bella, I totally agree! I've given up cake mixes--in fact I am trying to give up wheat exclusively, but I can still have chocolate cheesecake with a toasted pecan crust! I bet the teacher's loved it--but I'm with Bella--scratch is always best! Outstanding! 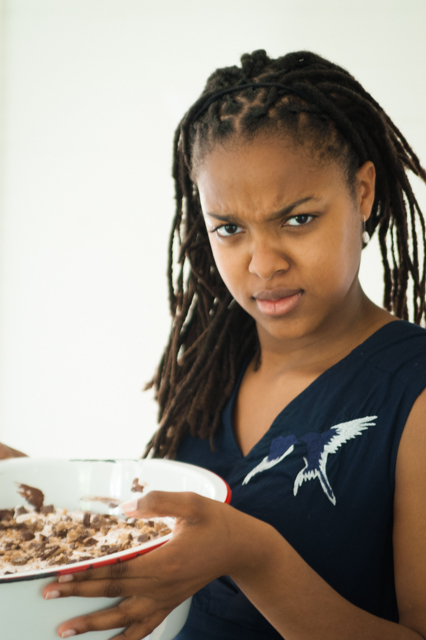 Her expression perfectly summarizes everything listed on the Cool Whip ingredients label. I have to wonder about the teachers' taste in desserts, though. Is it Rumor or Truth? My mother was a schoolteacher and was most assuredly not a Cool Whip Woman! Anyhow, anything gooey is a big hit with big groups of people, so I'm betting they will appreciate it!! I love Bella's face and I agree with her! Years ago, when my daughters were around 5 or 6 years old, my husband made a box mix cake. I was not there at the time but received reports on it later. My daughters had only ever seen a cake made from scratch. They stood around in disbelief, watching their dad. One said "That's not how mom does it!" Later the other daughter reported to me "Mom! Dad made a cake and didn't put any flour in it!" Hi, teachers are such a hard working group in general. It's sad that many people in our society patronize them. I always feel the same way when I see junky little gimracks described as th e "perfect teacher gift". What an arrogant thought. Oh, Bella, you are so right! Anonymous, I would agree with you but Phyllis teaches at this school and knows what these ladies like. She reports that they ignored her from-scratch cheesecake in favor of the Chocolate Bowl--to her chagrin but not to her surprise. It is indeed charity to do for others what will please them, not ourselves. (though we need not understand their tastes, ahem) Love that thousand-word shot. God bless you dear ladies! That face makes me laugh out loud! It looks something like my expression when I was served a Snickers Salad (as a salad, not a dessert) at a family Thanksgiving dinner. Carol, I gladly give you all the credit! That's like those Hamburger Helper commercials that praise mom for making a home cooked meal. I agree with Bella's face. People don't even know what real is anymore.